Thirty years after the meltdown of a flawed Soviet reactor in Ukraine and five years since the disaster at Japan's tsunami-swamped Fukushima-1 plant, the global nuclear power industry remains in flux. The heavily charged debate about whether it is safe, effective and economical to split atoms to generate electricity shows no sign of decay. “We see a viable market out there emerging, particularly with the carbon constraints that everybody is facing. But it’s also more competitive than it’s ever been,” said J. Scott Peterson, vice president for communications at the Nuclear Energy Institute. Ten nuclear reactors were connected to grids last year while two – one each in Germany and Britain – were closed. FILE - A worker, wearing a protective suit and a mask, levels ground at the tsunami-crippled Fukushima Dai-ichi nuclear power plant, operated by Tokyo Electric Power Co. (TEPCO), in Okuma, Fukushima Prefecture, northeastern Japan, Feb. 10, 2016. At present, about 400 reactors in 31 countries are online. More than 60 reactors are “under construction” in 15 countries – although that is a relative state as some completion has been delayed for decades for some due to policy debates, cost overruns or other construction delays. 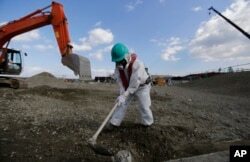 After the Fukushima disaster – with an ongoing cleanup that could take a century and cost hundreds of billions of dollars – nuclear was off the Japanese grid for nearly two years until two reactors restarted in August and October. Japan, which depends on imports for about 90 percent of its primary energy needs, now has two dozen reactors in the process of restart approvals and Prime Minister Shinzo Abe has insisted his country cannot do without nuclear power. 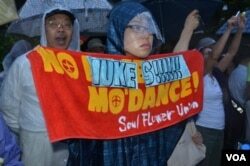 Surveys, however, show that the majority of Japanese now oppose restarting nuclear plants. There have been nearly 30 lawsuits and requests for temporary injunctions to suspend operations at 14 nuclear power plants since the Fukushima accident, according to activists. “The reality is that nuclear will never be a major source of energy for Japan again,” said Kendra Ulrich, a senior energy campaigner for Greenpeace, who is based in Tokyo. Decommissioning old plants has spawned an industry of its own. Disposal of waste and other operations related to decommissioning will be worth $200 billion by 2030, according to the French water and waste giant Veolia, which has acquired Kurion, a California-based company involved in the Fukushima cleanup. Enthusiasm for nuclear power suffered its first big blow at the end of March in 1979 when a virtually new 900 Mwe (megawatt electric output) commercial reactor in the U.S. state of Pennsylvania partially melted down, although there were no demonstrable health implications. Many Americans may be surprised to know that the Three Mile Island plant – site of the worst nuclear accident in the United States -- continues to run a single 800 MWe reactor and is one of the country's best-performing units. The United States – with 100 nuclear units in operation – produces nearly a third of the world's total atomic energy and relies on nuclear for about one fifth of the country's energy production. But its existing plants are being challenged economically and several have been retired. Fewer than 10 new plants are expected to come online by 2030. That also has contributed to the United States no longer being the dominant player in the global nuclear market. “We have significant competition from the Russians, from the South Koreans – which have won recent bids with their technology – and even from the Chinese who are starting to get into the export market,” said Peterson, with the nuclear industry lobbying group in Washington. What is happening in China “is a mixed blessing,” said Jane Nakano, a senior fellow in the Energy and National Security Program at the Center for Strategic and International Studies (CSIS) in Washington. At home, China’s ambitious domestic plant construction projects are not without controversy. Environmentalists in Hong Kong are expressing concern that a pair of 1,750 MWe nuclear reactors under construction in Taishan, 130 kilometers away, are based on a French design shown to have structural flaws. Brazil, China, Germany, India, Japan, Mexico, the Netherlands and Spain – representing nearly half of the world's population – now generate more electricity from non-hydro renewables than from nuclear power. Nations which already do not have any nuclear infrastructure will find “it’s not economically an easy endeavor,” according to CSIS’ Nakano. Initiating a nuclear energy program goes beyond establishing a reactor and acquiring a fuel source. Nakano points out that creating the regulatory framework, training skilled personnel and dealing with spent nuclear fuel – the latter a challenge still confronting the United States – takes a lot of time and money. “If you are serious about this industry and you want to be an exporter of this technology then you not only have to export the technology, but you have to export the regulatory regime and you have to export the safety culture,” said Peterson. But critics say safety has long been compromised by “regulatory capture” – when an industry has too much sway over its purported overseers. “It's the condition that created the Fukushima disaster,” said Ulrich. Another issue still confronting the industry is concern that countries acquiring fissile materials for civilian power plants will divert them for military purposes. India, for example, has not established a complete and verifiable separation of its civilian and military nuclear programs, according to a discussion paper authored by Kalman Robert and John Carlson at the Belfer Center’s Project on Managing the Atom. Nuclear proponents like to point out that the world has enough uranium to keep atomic power going for another couple of centuries and that utilizing it cuts reliance on pollution-causing fossil fuels and foreign energy sources. Its opponents dismiss nuclear as a viable option for addressing climate change. “Climate change is an immediate threat and nuclear takes an incredibly long time to build – the average construction time (for a new plant) is just under ten years,” Ulrich told VOA. The industry has also been beset by its promises of innovation not delivering results. So-called Generation III reactor designs – meant to be safer, simpler and cheaper, and touted in the 1990s – have not lived up to claims. Promises of further innovation continue to be made. “Right now, for instance, there’s an outspoken lobby making the case for Small Modular Reactors – an idea which is readily badged as Generation IV but actually goes back to the 1960s,” according to the independent 2015 World Nuclear Industry Status Report. The NEI predicts that between 2020 and 2025 these first small reactors will begin to penetrate the commercial market. But others are skeptical. Despite assurances that future generation reactors will be more efficient and safer, the industry – three decades after the world’s worst nuclear accident – still finds itself on the defensive on the safety issue. “At least in the U.S. mind Chernobyl couldn’t happen here just because of the technology differences and the way our plants are built,” said Peterson, noting the Soviet-era technology even at that time was considered far inferior to the Western technology. Contributing to the apprehension is that experts still cannot agree on the ultimate human toll from the Chernobyl meltdowns. 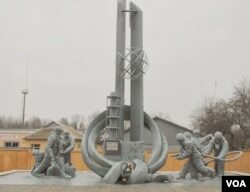 Dozens of emergency workers died from the radiation effects and the World Heath Organization, decades ago, predicted Chernobyl would cause 4,000 additional cancer deaths. But a Greenpeace-commissioned study put the eventual toll at 93,000. Nuclear energy’s proponents counter that our conventional energy sources are far more lethal, citing data showing coal killing 4,000 times more people per unit of energy produced than nuclear. Another comparative factor is what is called energy density. Wind turbines have a power density of one watt per square meter. To be equal to the output of a pair of typical reactors sitting on 100 hectares, one would need 2,000 square kilometers covered with windmills, about the size of the island nation of Mauritius. Japan could meet its total annual demand of 200 gigawatts if just 1 percent of its land area was covered with photo-voltaic cells, according to alternative energy evangelist Iida. And the wind could provide nine times that capacity in the island nation, where traditional natural resources are scarce. “Both solar and wind must be the substantial mix” to replace fossil fuels and nuclear in Japan, said Iida. Like the nuclear proponents, those touting green energy contend innovation is just around the corner that will allow their preferred choice for electricity generation to become the most efficient and affordable method. VOA Correspondent Steve Herman in March 2011 in Fukushima covered Japan's unfolding nuclear disaster and has also reported from Chernobyl in Ukraine about the ongoing cleanup from the April 26, 1986, accident.